Police opened fire on this blue Toyota Tacoma pickup truck in Torrance, Calif. while searching for a similar vehicle driven by murder suspect and ex-cop Christopher Dorner. Published 6:30 p.m. ET: They were in the wrong car at the wrong time. Two women who were delivering newspapers in Torrance, Calif., early Thursday were shot by jittery Los Angeles police officers who mistakenly thought cop-hunting fugitive Christopher Dorner might be in their vehicle, NBCLosAngeles.com reported. One was shot once and the other twice; both were were expected to survive. Police did not release their names. 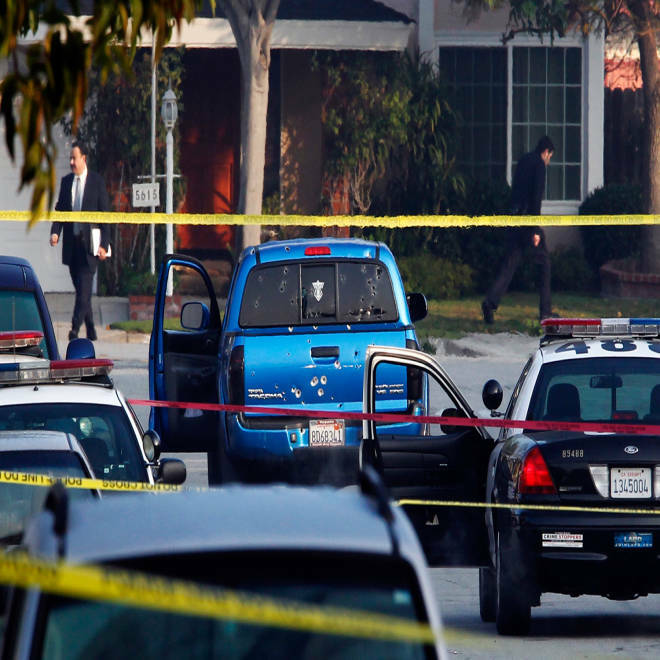 Police detectives investigate a shooting scene involving a black Honda pickup truck in Torrance, Calif. Police opened fire on the vehicle in a case of mistaken identity while searching for former Los Angeles police officer Christopher Dorner. The LAPD detectives were in the neighborhood to watch over a home they believed Dorner might target. Hours earlier, the fired cop had allegedly ambushed officers in two other cities, killing one of them. Across the region, cops on high alert were on the lookout for Dorner's dark-colored Nissan truck. In the predawn dark, they saw a blue pickup rolling through the streets with no headlights on. It's unclear what happened next, but LAPD Chief Charlie Beck confirmed the officers fired on the vehicle, hitting the two occupants. He said it was a tragic case of "mistaken identity." Less than a half-hour later, cops fired on another vehicle in Torrance, just two blocks away from the first scene, NBCLosAngeles.com reported. 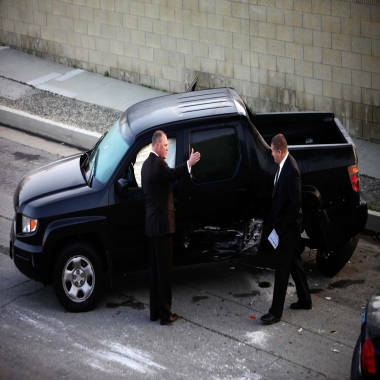 No one was injured in that vehicle, which was similar to Dorner's truck, police said. Dorner, 33, remains at large. Police say he waging a vendetta against the LAPD for firing him, and has already murdered a retired captain's daughter and her fiance, along with the officer slain in Riverside. They say he detailed his plans and hit list in a twisted online manifesto titled "Last Resort."